An unbiased, comprehensive introduction to the psychology of religion. This book integrates clinical, theoretical, and empirical literature, as well as biographical information of the lives of significant psychologists and their works. It contains new research on meditation, the correlational study of religion, religion and mental health, object relations theory, pluralism and social constructionism. 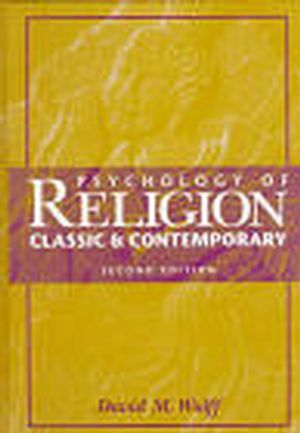 David H. Wulff is the author of Psychology of Religion: Classic and Contemporary, 2nd Edition, published by Wiley. Introduction: The Psychology of Religion in a Changing World. The Formal Beginnings: Three Traditions. The Biological Foundations of Religion. Behavioral and Comparative Theories of Religion. The Correlation Study of Religion. The Perspective of Sigmund Freud. Erik H. Erikson: Religion in the Human Life Cycle. C. J. Jung and the Analytical Tradition. William James and His Legacy.